The 416 Fire as seen Saturday from La Plata Canyon. The fire, at 51,068 acres as of Monday morning, is on track to become one of the largest wildfire in Colorado history. The 416 Fire is on track this week to become one of Colorado’s largest wildfires in state history. 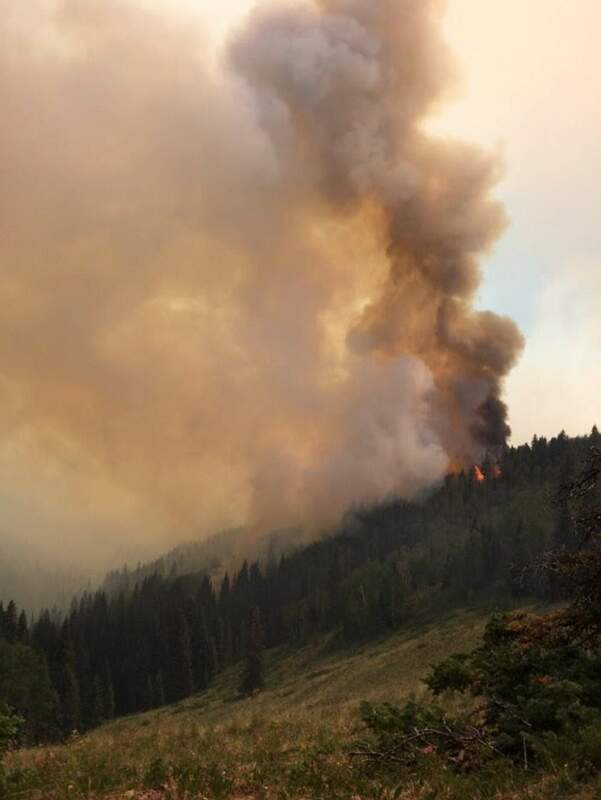 According to a Monday morning update from the National Incident Management Organization, the 416 Fire grew by 1,767 acres Sunday, bringing the total area burned to 51,068 acres. With no signs of slowing down, the 416 Fire could break the top five largest wildfires in Colorado state history. Currently, the Last Chance Fire that burned 52,000 acres in 2012 in eastern Colorado holds that spot. 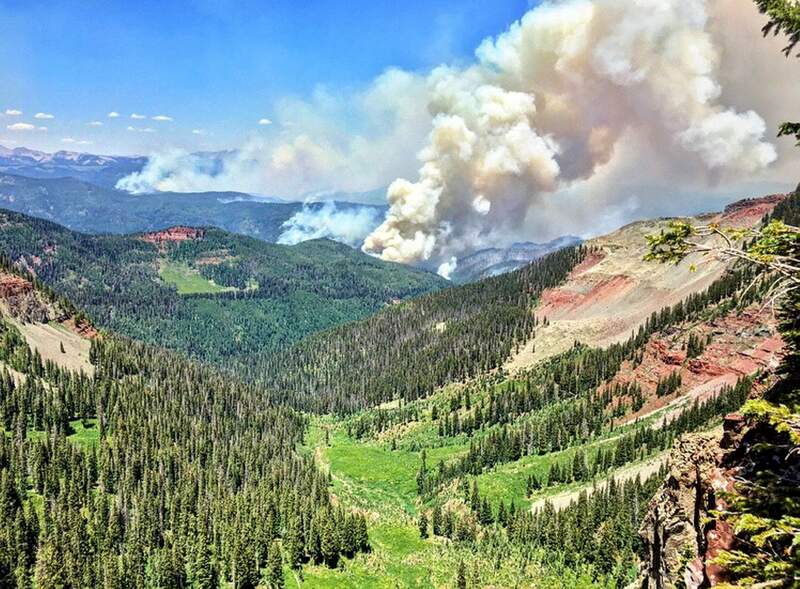 The fourth spot is held by the Missionary Ridge Fire, which ripped through 71,739 acres, also north of Durango. As of Monday afternoon, the Spring Fire in Costillo County jumped ahead of the 416 Fire in terms of total area burned, scorching more than 56,000 acres. The Colorado State Forest Service, which keeps track of these numbers, does not add fires to its list until the burns are fully contained. Julie Malingowski, a meteorologist with the National Weather Service in Grand Junction, said weather conditions this week will continue to be hot and dry, creating continued risk of fire danger and fire spread. “Temperatures are expected to rise gently over this week into the weekend,” she said. There is a chance for some isolated thunderstorms Tuesday in the San Juan Mountains, but not a lot of precipitation is expected with the storm. Though the storm’s not predicted to be widespread, it does carry the risk of dry lightning strikes and the risk will continue through Thursday. Besides the risk of lightning triggering new fires, Kris Eriksen, lead spokeswoman with the National Incident Management Organization overseeing the 416 Fire, said gusts from 40 to 50 mph could accompany thunderstorms – posing a danger to firefighters and offering a test of fire lines. “We believe the lines will hold, but it’s always good to get a test of the lines,” she said. One positive: Meteorologists assigned to the fire, Eriksen said, are growing increasingly confident about the possibilities of rain on Friday and into the weekend when a tropical storm off the coast of the Pacific Ocean could bring moisture. “There’ll be an increased chance for afternoon showers throughout the weekend,” Malingowski said. Still, the much-needed rainfall this weekend is not the start of the monsoon pattern fire experts say is the only real chance to extinguish the 416 Fire, as well as the Burro Fire further west. “We are not there yet,” Malingowski said. Also, on Tuesday firefighters will begin pulling equipment, pumps and hoses from the U-shaped southern perimeter of the fire for reassignment, Eriksen said. Weather conditions the past weekend allowed for significant progress on the 416 Fire, according to the Monday report, with firefighters finishing burnout operations on the fire’s southwestern edge. Crews will remain holding the fire line west of Forest Road 171 to Sheep Head Basin, southeast of the Hermosa Creek wilderness area, with the assistance of helicopter water drops. The 416 Fire burns a pocket of trees near the top end of the Elk Creek Drainage as seen from the northern perimeter near Purgatory Resort. With burnout operations concluded, firefighters have moved to the north edge of the fire in an effort to strengthen existing fire lines and prepare for future burnout operations to protect Purgatory Resort. Purgatory Resort announced the reopening of summer activities on Sunday. Fire officials said visitors should check location conditions when planning trips and activities to areas around the fire. County Road 124 from the junction of County Road 124A will be closed starting Monday, restricting access to Kennebec Pass trailhead. San Juan Basin Public Health on Monday issued an air-quality health advisory throughout La Plata County, as well as areas of Hinsdale, Montezuma and San Juan counties. Heavy smoke settled along the Animas River from north Durango down to the New Mexico line, the health department said. The smoke is expected to linger overnight, and clear around noon Tuesday. Areas around Purgatory Resort on Monday afternoon are expected to reach moderate to unhealthy levels for sensitive groups, such as children and seniors. Will Fourth of July revelers heed warnings about fire danger?